The most famous photo of Bigfoot is this one, shot on film by Roger Patterson and Robert Gimlin in 1967. 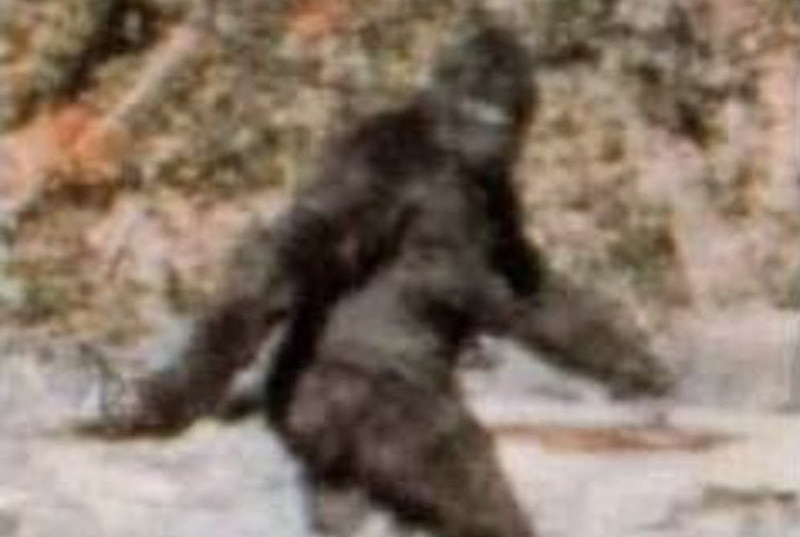 Courtesy of Patterson-Gimlin film, frame 352. Why are Americans so devoted to Bigfoot? You can find Bigfoot everywhere. Its image adorns coffee cups, T-shirts, bumper stickers, bottle openers, and other sundries. Bigfoot is the Canadian-American version of the abominable snowman that has been in the public imagination for over 60 years. It is a curious celebrity in that the kind of phenomenon that it represents—whether exclusively cultural or also biological—has yet to be worked out. What is not in dispute is that people insist that they have seen Bigfoot, even if what “seeing” entails is not entirely clear. If you count eyewitness reports irrespective of their apparent authenticity, claimed encounters with this inhumanly tall and hairy beast number in the thousands. The prosaic explanation is that there is an ape in the woods that’s pretty shy, and if you see one it is like seeing a bobcat—you’re lucky. But the persistence of this animal in the American imagination, considering that we have collected exactly zero verified specimens, suggests that this phenomenon is much more than a zoological curiosity. What really sets Bigfoot apart is its mythological gravity. A good myth has to have at least three ingredients: It has to say something about the human condition, it must signify something that people care about, and it has to communicate its deeper meaning in a concise and effective way. Take any of these elements away and the myth loses traction. The one thing that isn’t essential to a myth is a verifiable physical presence. The absence of specimens, the documentation of hoaxes, and even admissions of fakery haven’t eroded the Bigfoot myth. But that’s not to say that Bigfoot leaves no trace. Tales of feral man-monster chimeras were known from North America well before 1958, but it was a photograph of a cast of a gigantic, not-quite-human footprint on the front page of the Humboldt Times on October 6 of that year that thrust Bigfoot into the American collective consciousness. This was more than a campfire story; it was a record of something’s passing set in stone, enigmatic but undeniably real—you could touch it, after all. It was this concoction of the tangible and monstrous that hooked me on the myth as a child. My brother, eight years my senior, regularly fed me thirdhand stories of encounters, some of which were sensational accounts of abduction or violence toward human interlopers. He was an experienced backpacker, and if he decided such tales should not be dismissed out of hand, then I felt obligated to take them seriously. Beginning in the late 1960s, motion pictures of Bigfoot appeared. I regarded many of these films as hokey, but the better ones were wonderfully ambiguous, perfect fuel for an evolving myth. The myth of Bigfoot can be understood in the context of contemporary cultural anxieties, and it has adapted as those anxieties changed. In 1961 playwright and science writer Robert Ardrey’s popular account of human emergence, African Genesis, painted our ancestors as inherently homicidal, with an unquenchable thirst for territory. With the Cold War threatening our species with annihilation, we could understand how we got to that point but Ardrey’s thesis (which drew from the scientific orthodoxy of the time) explained why. Our predicament was a product, perhaps an inevitable one, from our ugly evolutionary past. Originally, Bigfoot was cast in this monster motif: tossing culverts, smelling terrible, terrorizing intruders. But as encounters increased, Bigfoot’s bellicosity faded. Most eyewitnesses had peaceful or at least merely startling experiences. Bigfoot pivoted gracefully from bogeyman—Ardrey’s nightmarish vision of our true nature—to something that we could all aspire to be. The monster morphed into an intelligent being that could really, truly, perpetually live off the land—a symbol for environmental stewardship. Bigfoot spoke to growing anxieties about the environment and our relentless destruction of it. As humans expanded in number, the wilderness shrank, becoming less mysterious and perhaps less interesting, and was definitely further fouled by garbage and pollution. Bigfoot endured in those shrinking woods, living quietly and invisibly without an apparent need for material things, and sightings continued unabated. Bigfoot fought no wars, built no factories, and persisted without destroying the natural order of things. Here was our hirsute kin, without the trappings of technology, existing without the comforts of civilization but living simply and wisely. Maybe Ardrey was wrong. We could have peace if we could only learn from our cousin, a teacher without words who led by example. Having Bigfoot in the woods brought back the allure of the unknown; it served as a foil for the intrepid explorer at a time when exploration itself was seemingly endangered. Bigfoot’s endurance thus has to do with its malleability. We do not know quite what it is. The sphinx is odd—being an amalgam of lion and human with a fondness for riddles—but it is not ambiguous. Bigfoot, being just beyond clear perception, defies a neat categorization. It seems menacing, but is this borne of our fear or is it truly dangerous? Is it hidden because it is wise to avoid us or merely—just like ourselves—afraid of the unknown? The consistent traits of Bigfoot are being big, hairy, and bipedal. Beyond that, all other characteristics are negotiable. Bigfoot’s ambiguity enables it to stay relevant. It serves us well as a monster when we need that escape, and it just as easily can stand in for as an imperturbable guardian of the wilderness. Either way Bigfoot embodies the American ideal of the rugged individualist; it is telling that Bigfoot is almost always described as being and acting alone. I’ve never seen Bigfoot and do not expect to. Human shenanigans seem to provide a sensible explanation as to what is going on. Even so, it is clear that Bigfoot is not impossible. I have wondered if an encounter would precipitate an existential crisis for me. Bigfoot also challenges scientific orthodoxy in ways that give myths legs. The disinterest of the scientific community in what some believe is our closest living relative is, to the community of Bigfoot enthusiasts, a moral transgression. Searching for it is deemed a waste of time by academics. Perhaps the idea that Bigfoot is not a real animal is understandable, but how easy it would be to disprove this! The prevailing attitude—that there is no value in investing time and money in a search—shows that the scientific community doesn’t even understand the importance of questions about Bigfoot. Why should scientists get to decide what is interesting and meaningful? Americans have always had a fraught relationship with scientific elites, because those elites act as gatekeepers of knowledge, and with that, they control some levers of power. Today, the elites’ disdain for Bigfoot seems to implicate them in bigger conspiracies: If the government won’t cop to knowing about Bigfoot, what more consequential secrets are they hiding? It is no accident that as the myth has evolved, an association has emerged between Bigfoot and UFOs. Wild man myths are common around the world and their origins are difficult to trace owing to their great antiquity. Not surprisingly, they have different manifestations cross-culturally. In Nepal it is promiscuous, gets drunk, and wrecks crops. In Russia it seems to seek out human contact and is a more of a cultural being. The beast has variable attributes in different Native American traditions. By comparison, the modern American Bigfoot is very mundane. In many encounters it is more or less indifferent to human presence, but the human eyewitness is changed forever. I am not certain why that is, but I’d guess it has to do with an encounter changing one’s sense of place in the cosmic order. Bigfoot presents an impossible uncertainty. In defying categorization, it makes no sense at all. It is then up to the percipient to construct a category that necessarily reorders reality. A heretofore, undreamt-of natural history emerges out of that reordering that assures us that we do not know all there is to know. The footprints, the photos, and the persuasion of other eyewitnesses testify that Bigfoot is there, and the rest of us can be drawn in, reassured that our sense of wonder is not borne of foolishness. How long will the Bigfoot myth endure? That might depend on it remaining undiscovered. If Bigfoot is ever found, primatologists will flock to the Pacific Northwest and we will begin to learn all about Sasquatch behavior, ecology, reproduction, and the like. There will be less room to imagine other possibilities. David Daegling is an anthropologist at the University of Florida. He has published extensively on skeletal function in primates and wrote Bigfoot Exposed: An Anthropologist Examines America’s Enduring Legend.